Approved last year, Raleigh folks are now working to bring the first parklet to downtown this year. Raleigh [ ] Space is a new initiative consisting of downtown business owners and members of the NC State College of Design to bring the first parklet to the city. The project is still coming together so make sure to keep an eye on it as they work towards their Fall 2014 completion date. An excerpt from the Raleigh [ ] Space site. Our logo reflects our vision. This parklet is a space with endless possibilities. It used to be a parking space, and it will be even more than a space to be enjoyed by pedestrians, bike riders and motorists; we envision a space that will house an ever-changing array of design installations. 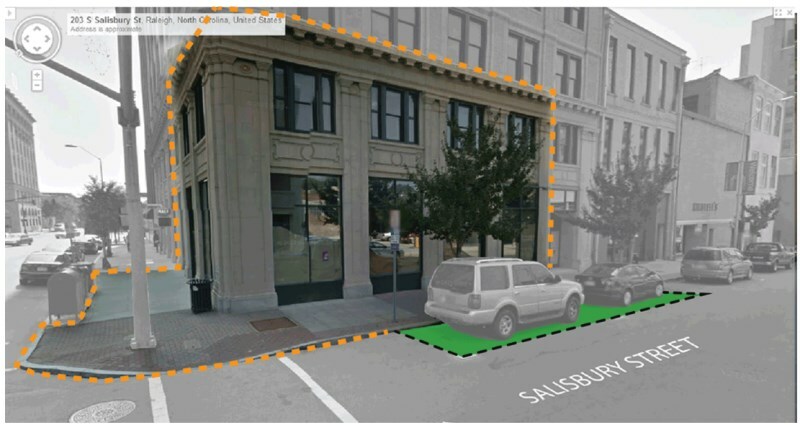 At the same time, we envision functional components that are in high demand on this corner: a place to park/lock bicycles and strollers, a dog-watering station, and possibly amenities for alternative vehicles. Insofar as it is possible, the parklet will be self-sustaining (reclaimed water, solar power). Follow them on Twitter and stay tuned for a kickstarter that will help the team get to their funding goal. Also, make sure to walk down to Salisbury Street this week during First Friday for a teaser of the new parklet. Date/Time: Fri., June 6 from 6 p.m. to 9 p.m.
Really glad you posted, Tina^ – had no idea about your events, definitely want to check it out this Sat. ! By the way, anyone know who owns that ugly deck in the photo background? That is a perfect location for entertain/retail stores and signature tall office building.